Are you considering renting a desk in any coworking spaces? Or perhaps a spot at a shared table? If you’re getting sick of competing for that one seat near the electrical outlet at your local Starbucks, then there are some things you should know before you join any coworking community. Not only are there rules of etiquette (some written, some not), but there are also some best practices to keep in mind if you want to make the most out of the experience. Gauging your noise level is going to be one of the most important things you’ll need to do if you want to get along with the other kids. Particularly in common spaces where sound is ambient, you’ll need to pay attention to the general volume of talking in the room as well as how loud people speak when they get on the phone. You don’t want to be THAT person who disrupts everyone else’s concentration with your insensitive shouting or earbuds overflowing with loud music. Monitor the volume of your music, and use headphones if possible, to help contain the sound. Take your in-person meetings to the private meeting rooms, which you’ll no doubt need to reserve, probably for an extra fee. Many coworking spaces feature private phone booths, so if you predict a meltdown or a particularly heated or enthusiastic conversation, get yourself to a booth and shut the door behind you! This should go without saying, but sadly, some people still believe in the dish fairy. Common spaces like kitchens and bathrooms are places where you should make sure to clean up after yourself. You don’t want to deal with anyone else’s mess, and no one wants to deal with yours, either. Also, learn the rules about what food is there for the community to share and what things belong to specific people. If you’re not sure, don’t touch it. Because really, do you want to be the one who stole someone’s last sushi bites? Or that muffin they’ve been patient enough to save for their afternoon coffee break? While we’re at it, let’s cover some more general food etiquette. One friend told me, “My biggest pet peeve is sitting next to my colleague when she is crunching on apples, nuts, all crunchy sounds, drives me nuts…” If your eating habits assault anyone’s senses, then it’s a good idea to take your eating out of the working area and into a designated eating space. 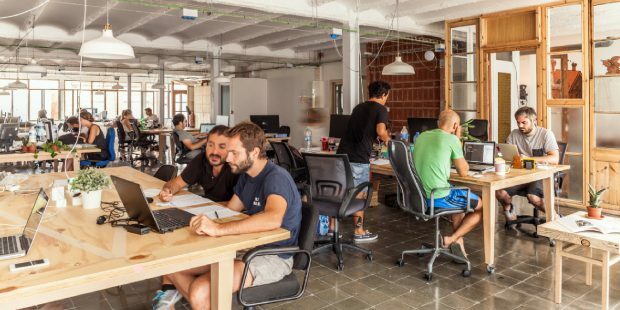 #Entrepreneurs, 5 things to remember next time your at a #coworking #space. Independence is the name of the game at coworking spaces. Sure there is usually a manager on duty, and you may very well need some type of tech support or information at some point. However, you should find that all of the basic information you need is readily available. Trust me, things like Wi-Fi passwords, instructions on using kitchen appliances, where to find supplies, and rules about what is shareable and what isn’t will not be kept a secret. Be friendly to your co-workers. Vibe is everything in a shared space, and everyone is responsible for bringing something positive to the table if you want to maintain a productive, pleasant environment. In general, you’ll want to be hyper aware of how you interact with others and how your actions may impact them. Don’t take other people’s stuff. Again, acquaint yourself with the house rules and make sure you understand which, if any supplies are communal, and what is privately owned, and therefore not available to you. Also, be aware of time. Make sure you leave promptly when you’re supposed to and don’t infringe on the time of the space managers or people who may have made arrangements for private rentals. So you see, coworking spaces clearly revolve around two things. Good boundaries and food. You’ll be able to exercise all of the freedom and flexibility you desire as an entrepreneur, but you’ll also be called upon to exhibit restraint and sensitivity to the needs of others. And on occasion, you may need to bring enough snacks for everyone.